I love when you link to my blog, thank you! I also love linking to other people’s content – to share it with my peeps. It’s called Link Love, and we could all do it a bit more. Today I’m presenting my favorite Link Love topics, also known as the topics I devour online! In one way or another they’re all linked to living a good (and creative) life – every day. Postal stamp collection at Bokmässan in Gothenburg. I hope you enjoyed my list of favorite topics. If you enjoyed the interview video I linked to I also recommend you visit Good Life Project, to watch more of those shows (like Daniel Pink, Brené Brown, and Karen Salmansohn)! I’m also into reading about planning, finding new ideas, lists of good novels and tv-shows I should watch, photography tips, general writing advice – and thousands of other topics. I share my most inspirational link finds here and by making such Link Love Lists as this one. What’s your favorite article subjects to pursue? You can check out other’s link love lists here. This entry was posted in Digital Life, Inspiration and tagged blogging, entrepreneurship, happiness, link love. Bookmark the permalink. My! 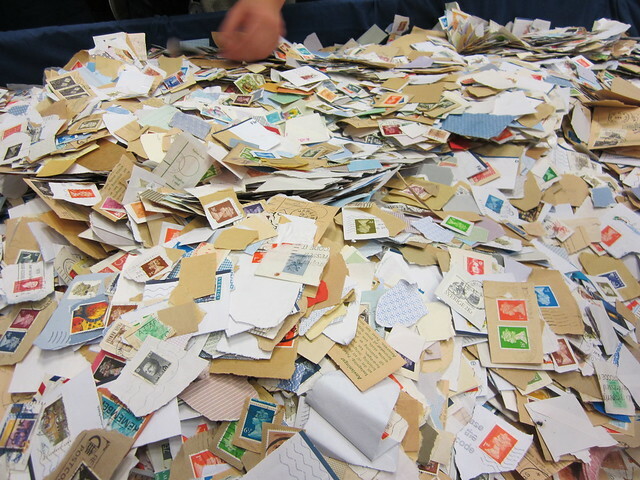 You do have lots of mail ephemera! Great collection! Thanks for the links! Haha, those are not my stamps Mary. It’s from an exhibition! I enjoyed many of your links, even pinned some for later viewing. I enjoy how you write. thank you for sharing. Thanks Diane, glad you like my topics and found inspiration in this post! I am just exploring your link list too – lots of interesting finds. Thanks for sharing it! Oh thank you! THAT is a comment that makes a girl super happy! oh that stamp collection! OH! !